I was in India last year for makar sankranti after many years. It was wonderful to see all the variety of chikki, gajak, pithe, payesh that were so easily available. I even brought back some with me. 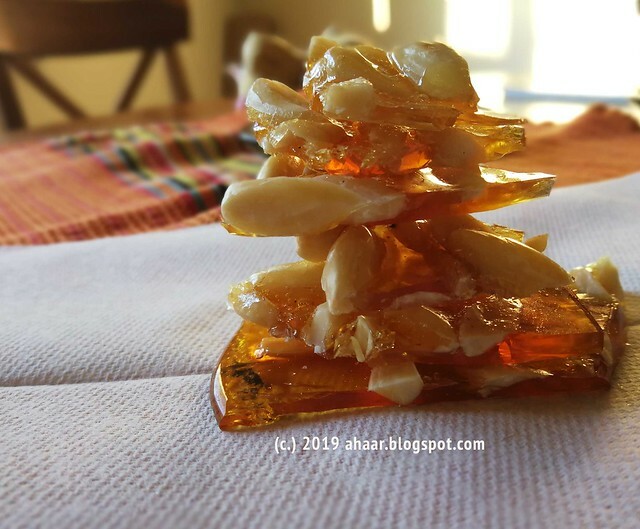 This year as sankranti rolled around, I made some almond brittle or badam chikki. The Great British baking show has turned them into little critics. They are walking around pouting things like "is it crunchy enough?" "is the bread hollow sounding?," and all the things they have seen on the screen. 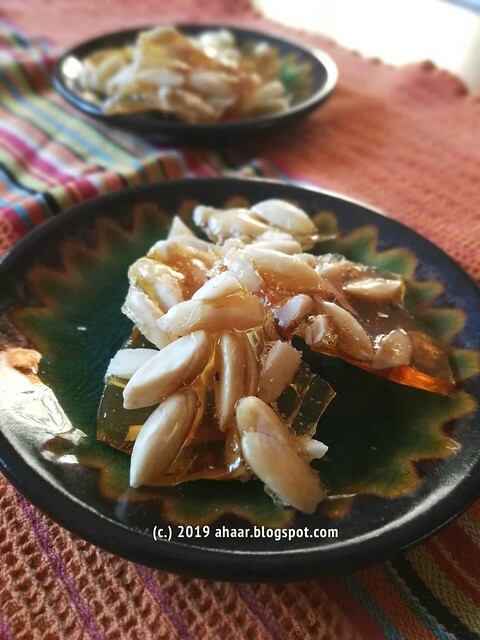 Surely enough, as soon as I told them I made some almond brittle, they asked, how is your caramel. The first thing they did, was to see if it was crunchy enough. It was, so I was saved. Blanch the almonds and chop them into little pieces. Heat the oven to 400 deg and toast them for 5 minutes. Let it cool. In the meantime, take a thick bottomed pan and pour in the sugar. Then add in the water and turn the heat to medium high. The sugar will melt and start bubbling. It is a 10-15 minute process so keep an eye on the syrup. Once it starts to thicken, turn the heat to high and watch the color to change. As soon the color turns golden or light brown, take it off the heat and pour it over the almonds on the tray. Let it cool. Cut it in small pieces and enjoy.